MOSCOW (Sputnik) - The toxicology experts in their comments to Sputnik doubted that the nerve agent could persist in the environment since the March 4 incident with the Skripals in Salisbury to affect two more people in Amesbury four months later, causing death of one of the victims. On Monday, UK Defence Secretary Gavin Williamson accused Russia of carrying out the poisoning attack in Amesbury. In turn, the Russian Foreign Ministry dismissed the accusations as "good old mantra" and urged the UK authorities to carry out a comprehensive investigation. On July 4, the UK police reported about an incident in Amesbury, Wiltshire, where two people were exposed to an unknown substance and were hospitalized in critical condition. Shortly after, the UK police announced that the couple, Dawn Sturgess and Charlie Rowley, were believed to have handled an item allegedly contaminated with the same military-grade nerve agent which was allegedly used in the recent attack on former Russian double agent Sergei Skripal and his daughter Yulia in Salisbury, located several miles from Amesbury. Both attacks took place not far from the Porton Down lab, one of the UK government's main chemical research facilities, involved in both investigations. The odd coincidence prompted Moscow on Wednesday to demand that London disclose its program on synthesis of chemical warfare agents. According to the Russian Embassy in London, the fact that UK experts had swiftly identified the poison type and provided advice to the doctors who treated the victims indicates that the lab "has indeed researched and stockpiled such a chemical agent and the respective antidotes." "If the most recent cases were indeed poisonings, and if indeed the poison was a Novichok nerve agent, it would seem unlikely that the chemical could have persisted for 4 months in sufficient quantities to cause poisonings from presumably an incidental contact," Rudy J. Richardson, a professor of Toxicology at University of Michigan, said. Dr. Richardson noted however that Novichok-type nerve agents had been designed to be much more persistent than most other organophosphorus nerve agents. The same viewpoint was expressed by a chemical weapons expert at the Middlebury Institute of International Studies at Monterey. "I’m puzzled as to how the couple in Amesbury were exposed. Four months is a very long time for a nerve agent to still be active in the environment, but there have been reports that at least some of the Novichoks are more stable than other nerve agents, such as sarin," Mark Bishop said. Dr. Alastair Hay, a professor of environmental toxicology at the University of Leeds, said that nerve agents disappear in the environment through two processes – evaporation with higher temperatures accelerating it and contact with water in a process of hydrolysis which degrades the agent. "But rates of hydrolysis vary enormously between nerve agents, and some are much more slowly broken down. The Novichoks appear to be in this last category, but there is no published literature on this. It is data that is required urgently," the expert noted. 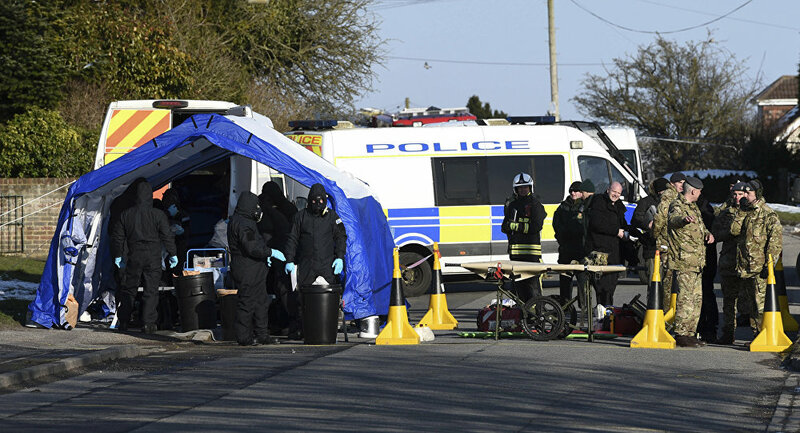 Bishop doubted that the couple in Amesbury could have been affected by the toxic substance left after the Skripal alleged poisoning in early March though he mentioned that it was hard to avoid the thought that the two incidents were somehow linked. "At least some of the Novichoks are thought to be solids, which could last longer in the environment. It still seems unlikely to me that they would have come in contact with a Novichok left in the environment from the Salisbury attack," the expert said. Dr. Hay yet expressed assumption that the incident in Amesbury could be residual contamination from the Skripals incident, most likely caused by skin contact, but stressed that there was no certainty about that. As for the suggestions about a possible country of origin, Dr. Richardson highlighted that production of Novichok-type agents could not be attributed to one particular country. "It is also worth noting that the technology to produce Novichok agents is now widely known and the ability to produce such agents could be found in any country – it only depends on some expertise in chemical synthesis and obtaining the precursor chemicals," Dr. Richardson said. The expert noted that it had been openly published in the scientific literature that, for example, Novichok-type nerve agents had been produced by chemists in Iran at least in small quantities for research purposes. On Sunday, the UK Metropolitan Police said that a woman, identified as Dawn Sturgess, had died in a local hospital, one week after being exposed to a toxic substance in Amesbury. The police have launched a murder inquiry. On Tuesday, the Salisbury District Hospital said that the second victim, 45-year-old Charlie Rowley, regained consciousness. Earlier in the day, the hospital said that Rowley was no longer in critical condition. Dr. Richardson called absorbed dose of the poison at the site of action one of the most important variables. He added that the absorbed dose itself depends on many factors including the amount of the exposure and the route of administration. "In addition, individual susceptibility to a given dose of a poison depends upon many things, including body weight, gender, age, and the ability to activate or deactivate a given poison through biotransformation (xenobiotic metabolism)," the expert said. The same factors as the reason for different reaction of victims to the poisoning by the toxic substance were named by Dr. Hay. "The dose of nerve agent which Dawn Sturgess received may have been different from that which the Skripals had, as may the time before specific antidotes were given. Added to which, there may also been differences in the health status of the Skripals versus Dawn Sturgess," he said. The expert stressed that a person in robust health would have a better chance of dealing with the poisoning and the received treatment. Dr. Richardson noted that it was not possible to determine the specific nerve agent based only on symptoms of victims. He stressed that only a relatively sophisticated chemical analysis could identify the specific agent. "The signs and symptoms described in these two recent cases could arise from poisoning by any inhibitor of acetylcholinesterase (AChE)," the expert added. Dr. Hay, in turn, said that all the signs and symptoms of the Amesbury incident victims fit nerve agent exposure, and that the treatment has been for nerve agent toxicity. "No opiates or other substances were found in patient samples to explain the symptoms," he added. Summing up all reflections on why only one of four victims of the alleged affection by Novichok-type nerve agent has died, Dr. Richardson stated that all people are different and not everyone responds to a given poison in exactly the same way. On March 4, Skripal and his daughter were found unconscious on a bench at a shopping center in Salisbury. The United Kingdom and its allies have accused Moscow of having orchestrated the attack with what UK experts claim was the A234 nerve agent, albeit without presenting any proof. Russian authorities have firmly refuted the allegations as groundless. Both Skripals have since been discharged from the hospital.